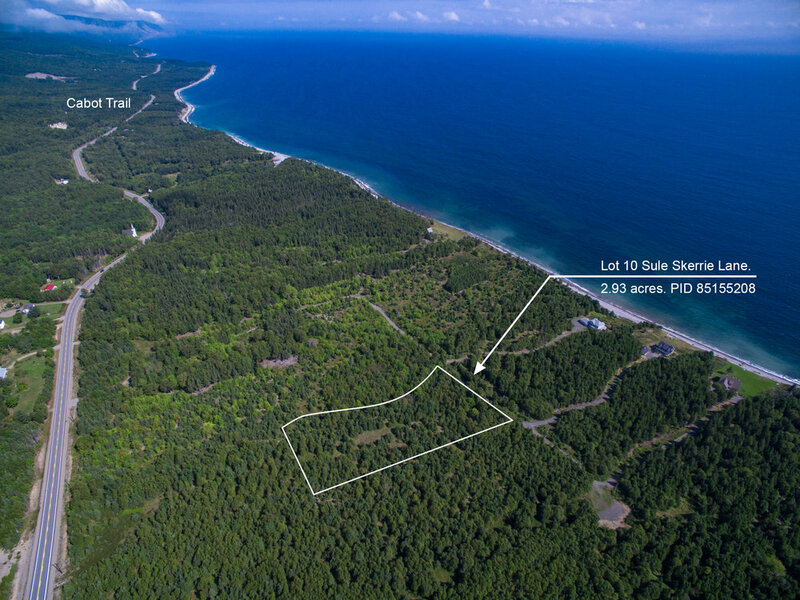 A spacious 2.93 acre lot with excellent Ocean and Beach access, located on Cape Breton, Canada. Lot 10 is located along the famed Cabot Trail... one of the most spectacular places in eastern Canada. 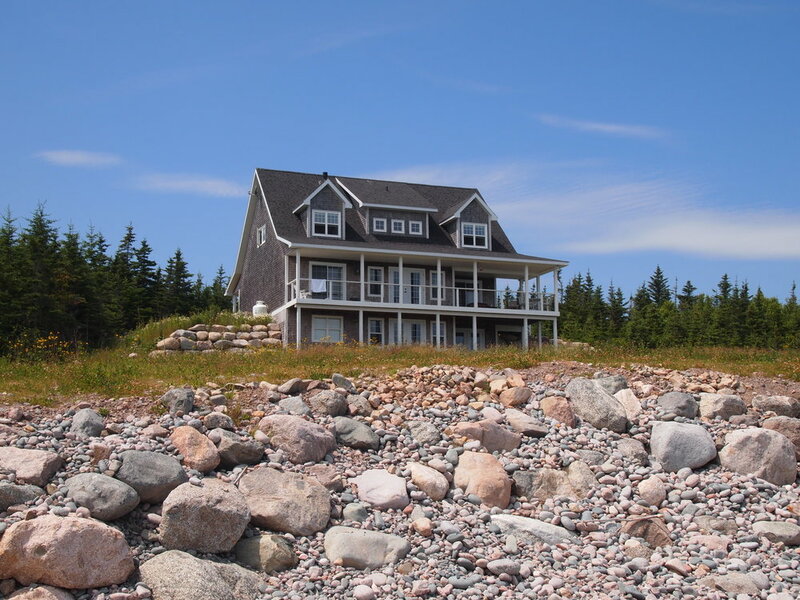 Year round access, wonderful neighbours and only steps from a lovely beach and picturesque shoreline. This is a fantastic setting for a beautiful vacation and retirement home. Air photo showing Lot 9 (2.934 acres) outlined. 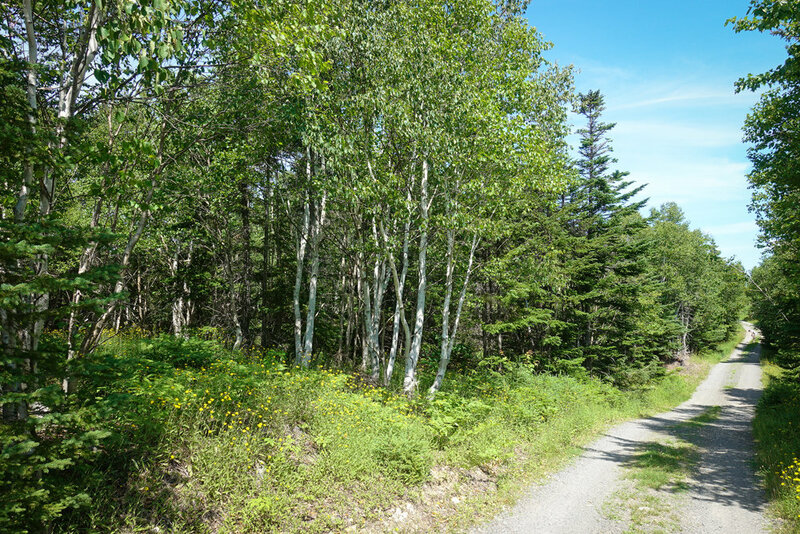 The land has great access year around off the Cabot Trail and nearby access to the beach and ocean and lots of privacy. 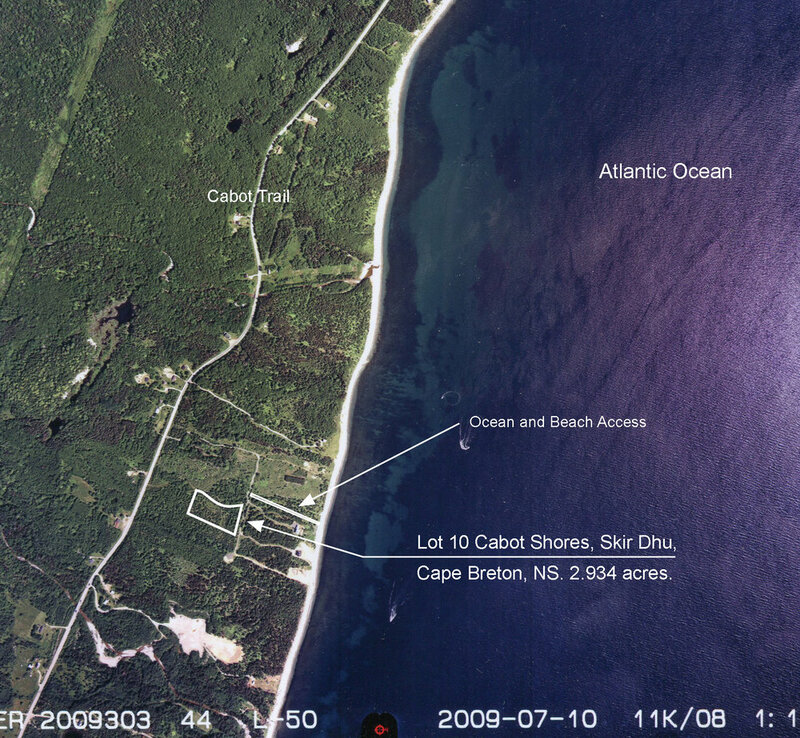 Air photo indicating Lot 10 and the shoreline of the North Shore of Cape Breton along the Cabot Trail. Picture along Sule Skerrie Lane and Lot 10. The lot starts at the posted lot sign and follows the road for 312.15 feet. This picture was taken along Sule Skerrie Lane with Lot 10 on the left. 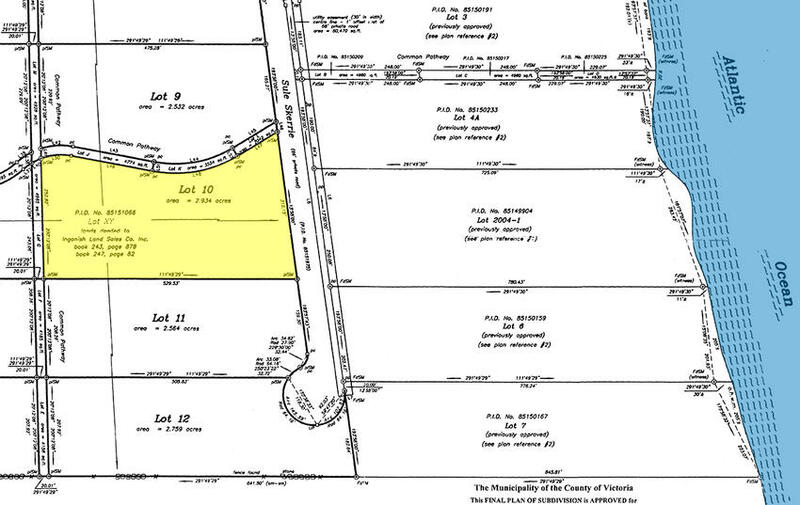 Lot 10 has over 312 feet of roadfront on this gravel surface private road. Electricity and phone service is available at roadside. Looking into Lot 10 from the Lot 10 / Lot 9 property line. Picture taken on your land. The land is nicely treed throughout in Pine, Fir, Spruce, Poplar, Birch and Maple trees. Good dry ground and open areas making it easy to walk through. Lot 10 Skir Dhu - 2.93 acres. Making our way down to the shore via the common use pathway. The perfect place to spend a warm summer's day. 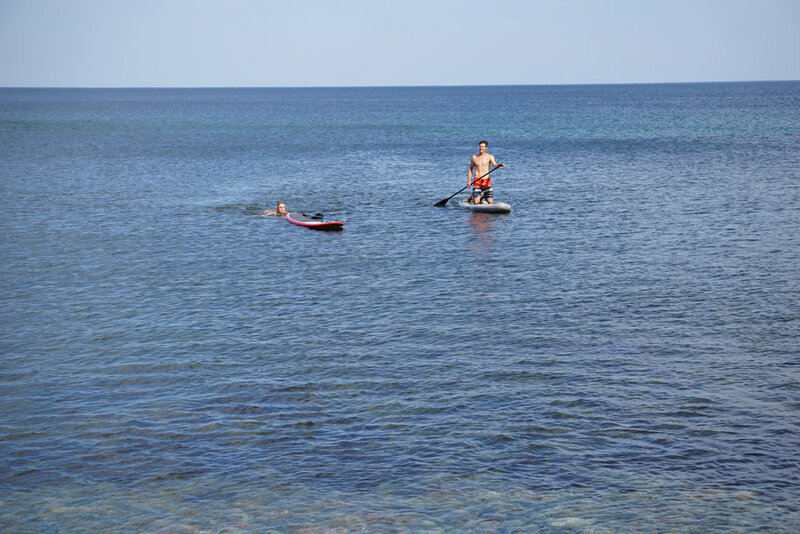 From your land the shore is easy to reach to enjoy your favorite watersport activity. Neighboring home in the subdivision. Ingonish Beach is a favorite destination for locals and tourists to the area. This fine sand beach, perfect for families, is about 20 minutes north of your land. 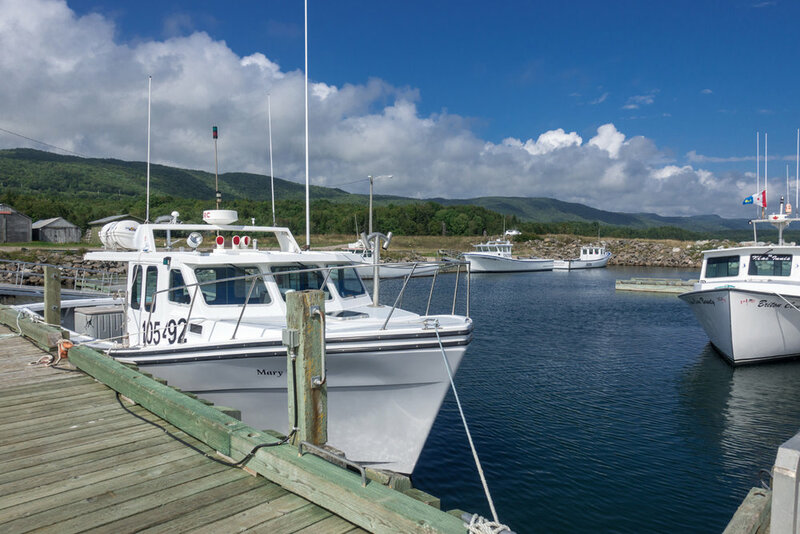 Just a couple miles from your land off the Cabot Trail is Little Wharf Harbour - an active fishing wharf and boat launch site. Survey highlighting Lot 10. 2.934 acres with 312 feet (95 meters) or road front and a depth of 520 feet (158 meters). Air photo outlining the lot location. The photo also indicates the access walkway to the ocean and beach. 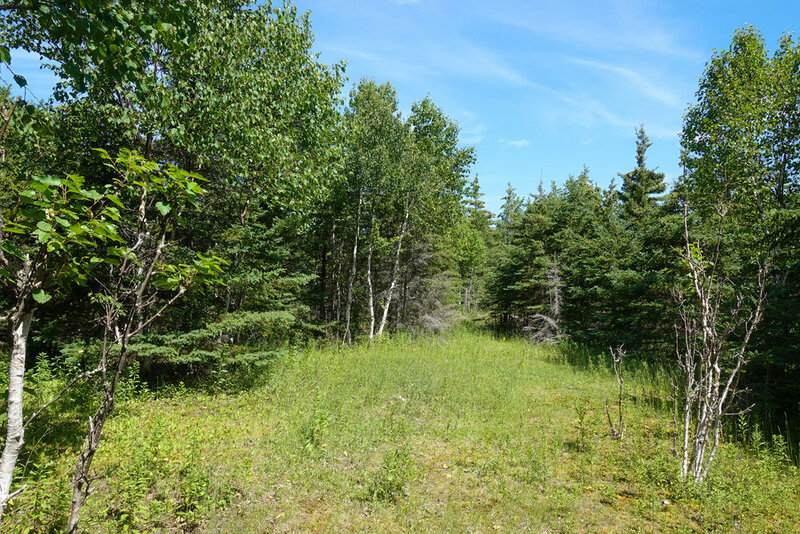 Land located at along the Cabot Trail in the Sule Skerrie Subdivision, at Skir Dhu, in the County of Victoria, Cape Breton Island, Nova Scotia. Being Lot 10 on Plan # 88654679. - 312.15 feet of road front along Sule Skerrie Road - a quiet, well maintained gravel road with the development. Just steps from the world famous Cabot Trail. - Northerly, Westerly and Southerly property boundaries measures 519.39 feet, 252.82 feet, 529.53 feet respectively. - Within walking distance from the ocean shoreline via a deeded access trail. 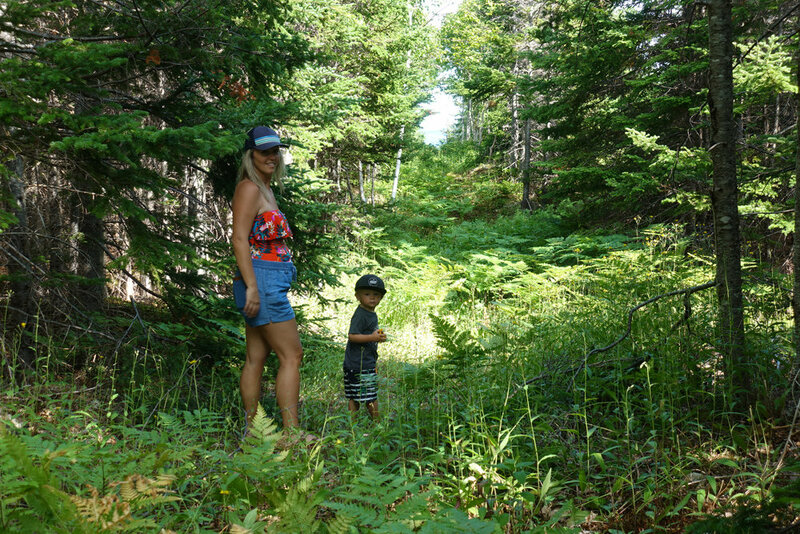 - The spectacular hillsides of the Cape Breton Highlands and the French River Wilderness Area are within view of your land. - Low land ownership costs. - There are no obligations to build or improve your land. - You can hear the rolling waves from St. Anne's Bay and the Atlantic Ocean. 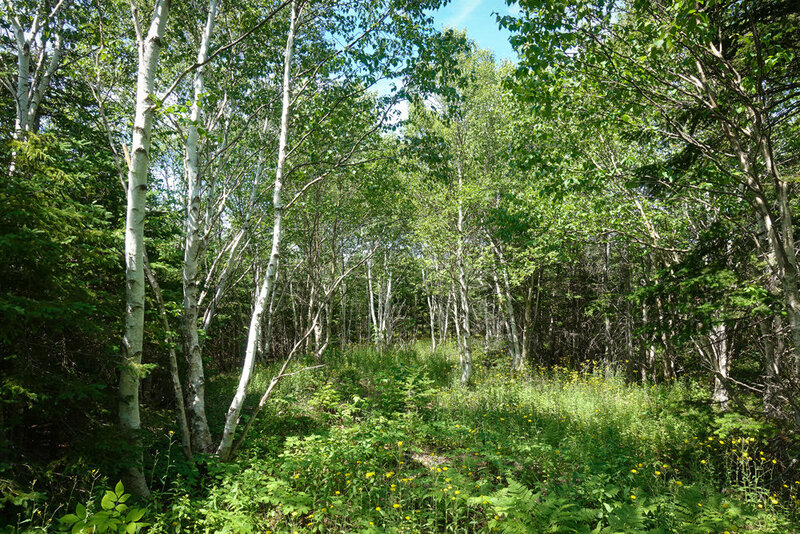 - Your land is within easy reach of several towns and communities - Ingonish, Baddeck, Sydney. - Owner financing is available to all buyers. 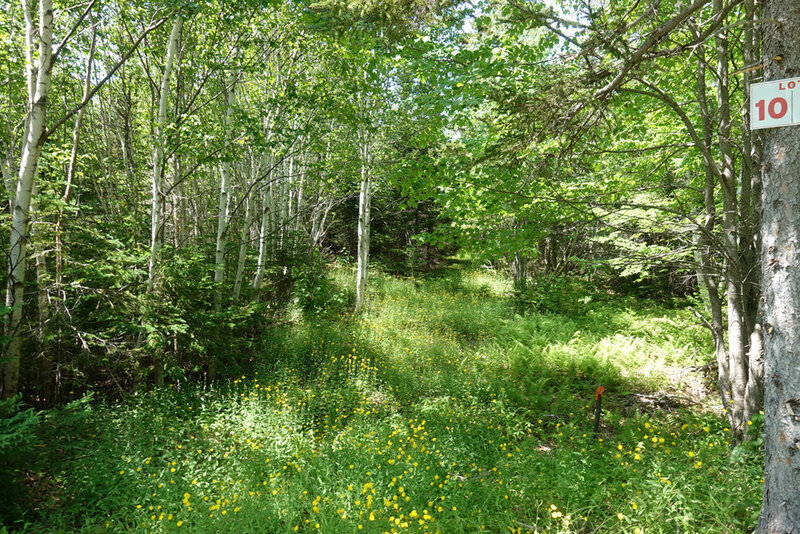 This lovely 2.93 acre surveyed lot is nestled along the world-renowned Cabot Trail in Cape Breton. Topographically, the land is high and dry, mostly level throughout and the ground drains well. There is a nice variety of trees growing here that include Maple, Spruce, Poplar, Birch, Fir and Pine. The trees are nicely spaced with small open areas between making the land easy to walk and allowing nice hillside views towards the west. Although there are no requirements to build and improve your land, it is perfectly suited for a cottage, log home, and year round residence whenever you are ready to start construction. With low ownership costs, it is the perfect land investment for someone looking to buy now while prices are still affordable. There are currently four beautiful homes and cottages built on neighboring lots, the owners being from Canada and the USA. 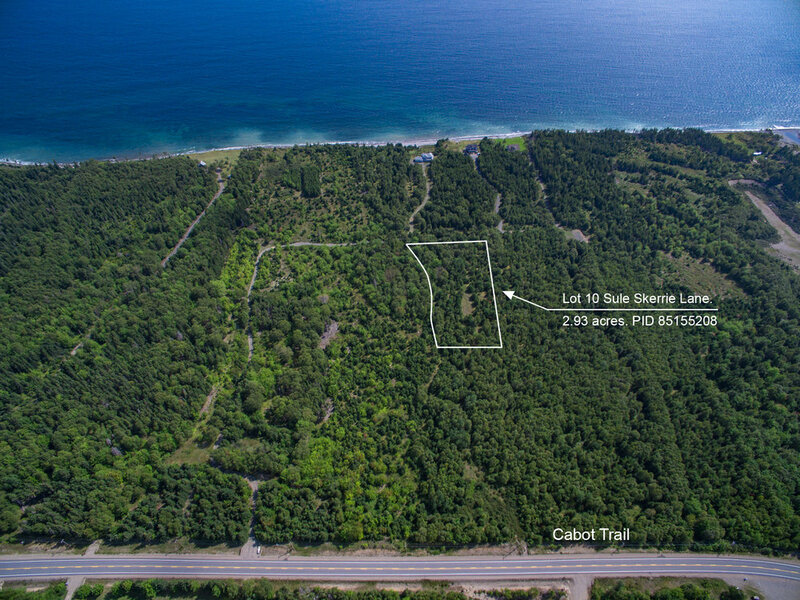 The land is just 750 feet away via a walking trail from the beach and the Atlantic where you can enjoy long picturesque beach walks, water sports and outdoor activities like swimming, kayaking, canoeing, boating, and fishing. You’ll spot bald eagles soaring overhead, and may even spot whales and seals in the distance. Just a few miles south of your land is Little Wharf Harbour with boat wharf and moorage. When in season, you can purchase fresh lobster and crab here direct from the local fishermen. There is also lots to do here in winter months! Great hiking, snowshoeing and cross country skiing on the local trails as well as on marked trails in the Cape Breton Highlands National Park. When snow conditions allow, enjoy downhill skiing at Ski Cape Smokey just 20 minutes from your property. And fantastic snowmobiling throughout the Cape Breton Highlands. 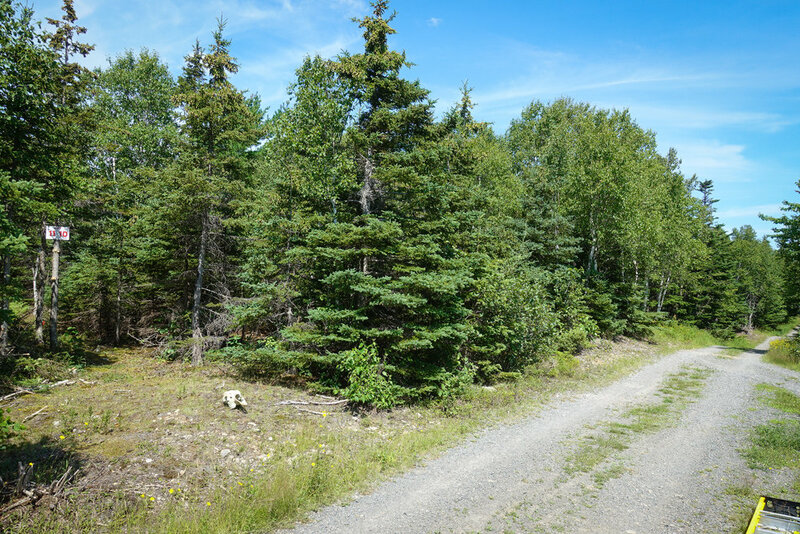 The land is located in Skir Dhu, on the North Shore of Cape Breton Island, just 20 minutes from Cape Smokey Provincial Park, between the Cape Breton Highlands National Park and the charming village of Baddeck. The North Shore is home to a vast array of wildlife, a crab and lobster fishery, and many artisans, crafters, cafes and restaurants. 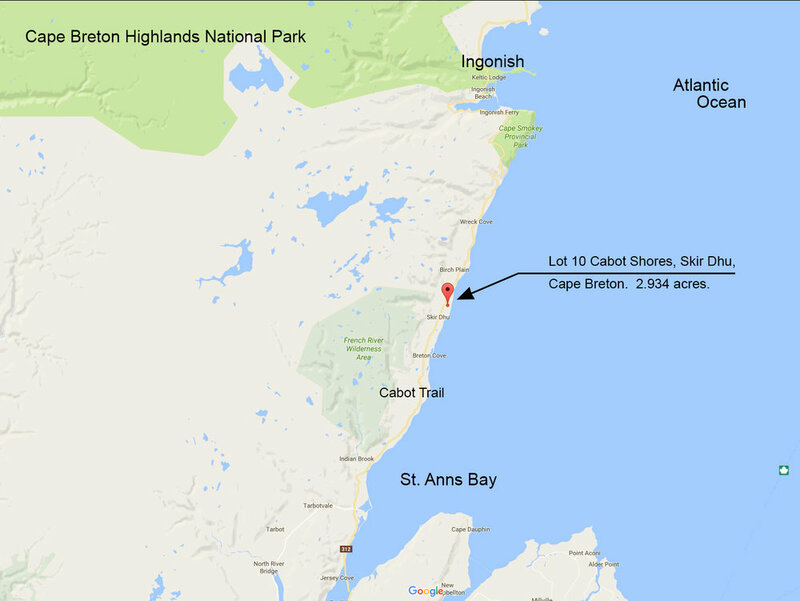 The community of Ingonish is 32 kilometers (20 miles) to the north along the Cabot Trail, with great shopping, beaches, health care, banking, post office, building supplies, accommodations, and a variety of local dining options. 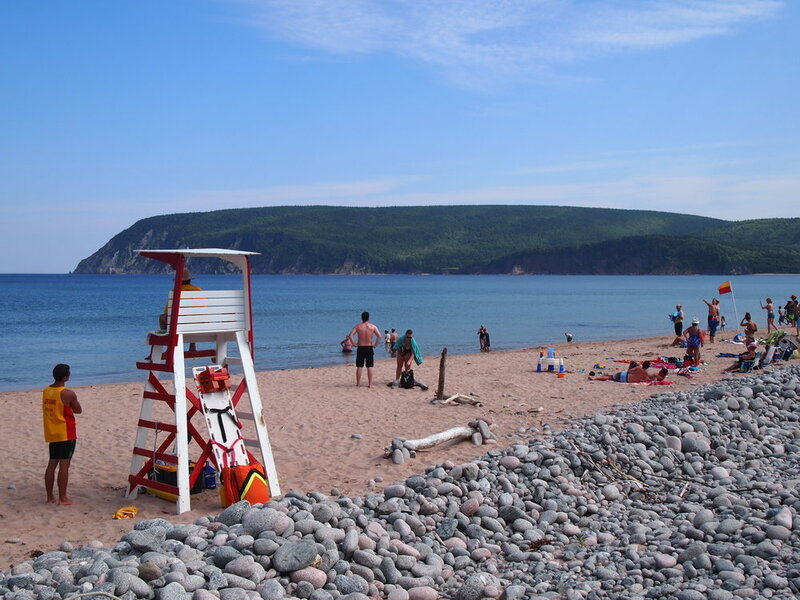 Ingonish Beach boasts both freshwater and salt water swimming the whole family will enjoy. The community of Baddeck is 65 kilometers (40 miles) to the south and is home to the Alexander Graham Bell National Historic Site, quaint gift shops, delicious cafes, local dining options, health care and a beautiful marina on the Bras d’Or Lakes. You’ll find all amenities between the two communities. Here you can escape the stresses of city life to vacation, rest, and relax, while creating an east coast getaway tradition your family will enjoy for years to come. We look forward to hearing from you. Term Sale: $19,500.00, payable $1,500.00 cash with order and seventy-two (72) monthly payments of $250.00 each, and interest. Additional 10% discount if paid in full within 30 days: $17,550.00, if paid $1,550.00 down payment with order and the balance of $16,000.00 within thirty days thereafter.